March | 2015 | Namaste to you, Sir! Make your juice and drink it too! Juicing is everywhere these days, it’s suggested as the perfect way to detox, lose weight, incorporate more vegetable and fruits, heal and alkalise your body. So much information is hard to ignore, isn’t it? I’ve been now drinking juice for breakfast for 2 years and all I can say, from my own experience, is that it makes a big difference. You feel lighter and more energized. I started with my morning juices when I was doing an alkaline detox and retained the practise as an easy way to incorporate vegetables that I normally wouldn’t be eating regularly, like fennel. After 2 years of trying different juices and creating my own, I’ve come to the conclusion that you don’t need a million ingredients to make a good juice, and that most books out there are full of recipes that no one ever tested (I’m sure of it, I had to many yucky juice experiences for it to be a matter of taste or bad luck). I have added a lot of the recipes I never had time to post about; including my collection of iced tea recipes; and a chart with the vitamins and minerals of each of the veg and fruits used and how these vitamins and minerals are used by your body, so you can actually know what you are drinking. I’ve even sneaked some of my own drawings, which are there just to make you smile. All the photos on the book are real, as in, I haven’t styled them to look brighter or prettier than the juices really are. I haven’t added colourant or fake anything. What you see is what you get, as the phrase goes. And some of the juices have pretty amazing colours, like the one in this post, which I have called “The Thing” after the orange character in the Fantastic Four. It takes only 3 ingredients and makes for a very healthy morning breakfast. 1 small slice of ginger (it can be any size you want, just don’t make it too big or your whole juice will taste like ginger). 1 grapefruit (grapefruit, unlike orange, is alkaline which is better for you). 1.- Peel your ginger and grapefruit. Slice the grapefruit in two. 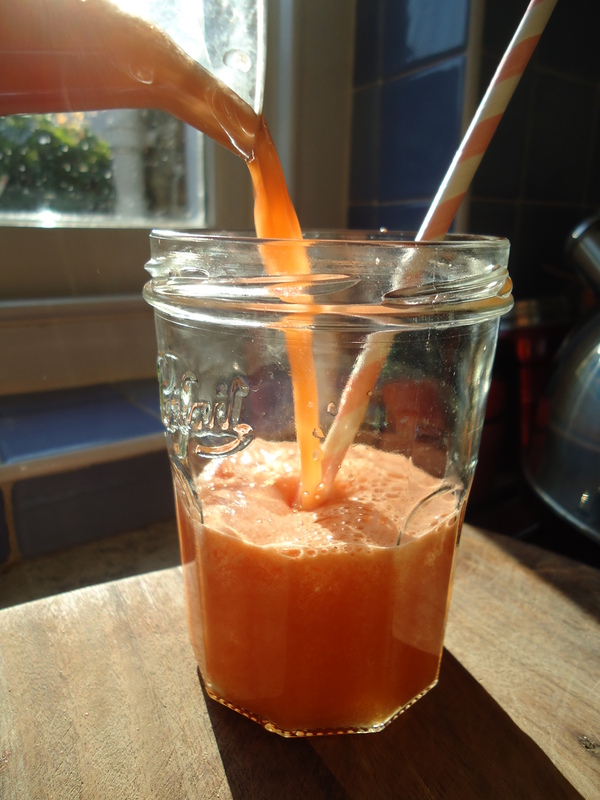 3.- Place the 100 ml water on the juicer jar or glass into which you’ll be pouring the juice (this is easier than adding the water afterwards and having to stir with a spoon, also this way you don’t have to wash a spoon). 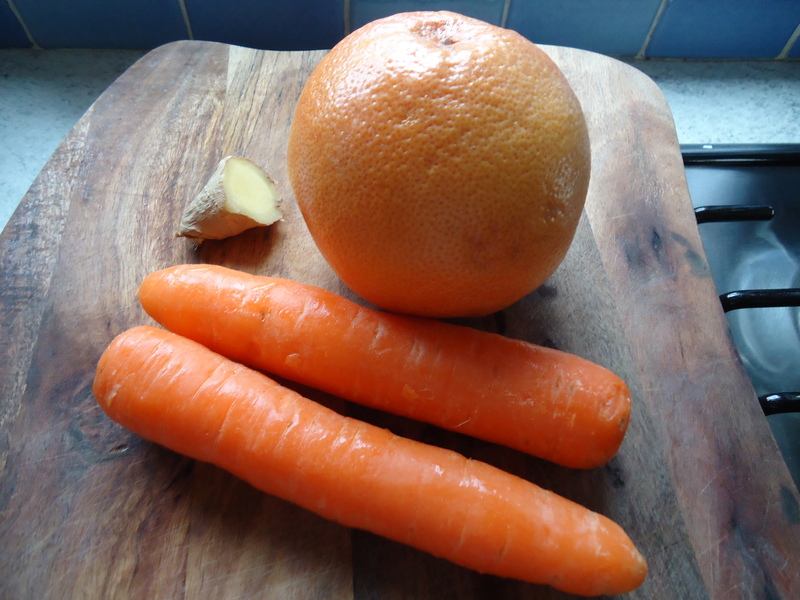 4.- Place the ginger first on the juicer, then the carrots and finally the grapefruit since being the juiciest of all the items, it will help drag any remaining goodness from the other two veg. Taste: Not too sweet, the carrot and grapefruit blend to generate a flavour that’s neither carrot nor grapefruit. It doesn’t have the earthy tasty some juices with root vegetables have. It feels a lot more “morning juice” that some of the green juices and it has a nice ginger kick to wake you up 🙂 It’s a good juice to start with if you’ve never had juices with vegetables in them. But it is not all just feeding the body, right? What about the soul and the spirit? In case you care about nourishing those too, each juice comes with a haiku, koan or quote, something to think about or laugh about while sipping your juice. I love that sort of thing and I hope you love it too. Have a great Friday!! Enjoy the sun that is shyly shinning over London at the moment. Pts! If you are looking for more juices, why not try an amazing Mango juice or a Detoxing Fennel one? 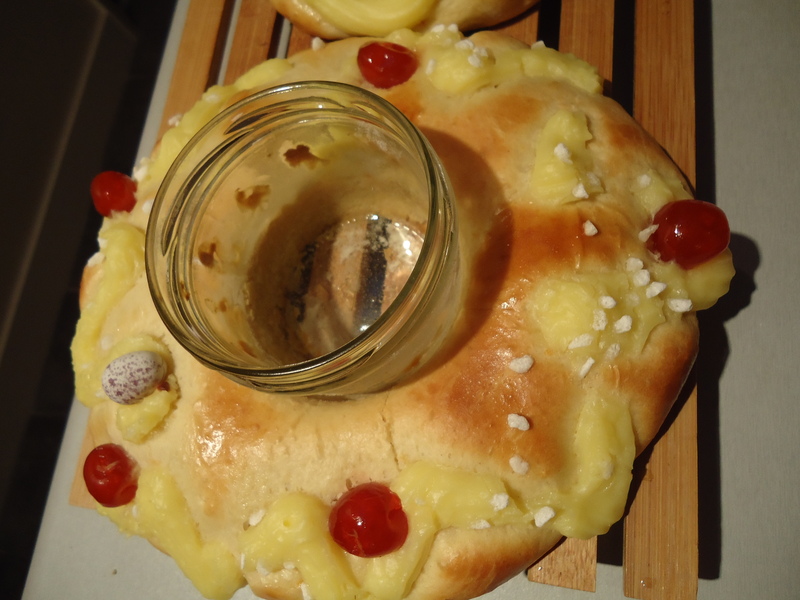 Rosca de Pascua: an Argentine Easter tradition. Easter is fast approaching, and for once I decided to post this recipe before people were looking for inspiration, rather than after. With its soft, sweet and aromatic interior, and an outer layer of creme pattisiere and glase cherries, this is one of the nicest sweet breads you’ll ever eat. 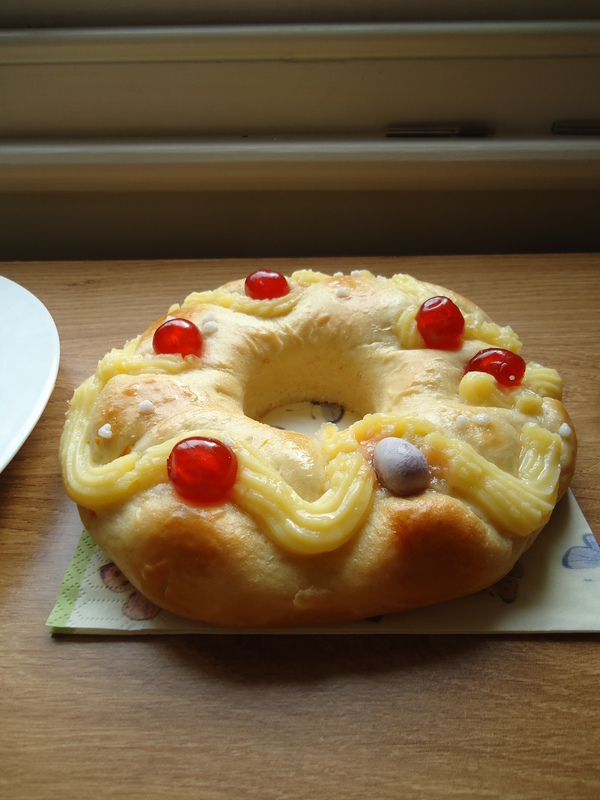 Rosca de Pascua is to Argentine people what hot cross buns are to the English and Irish: a must have for the Easter holiday. 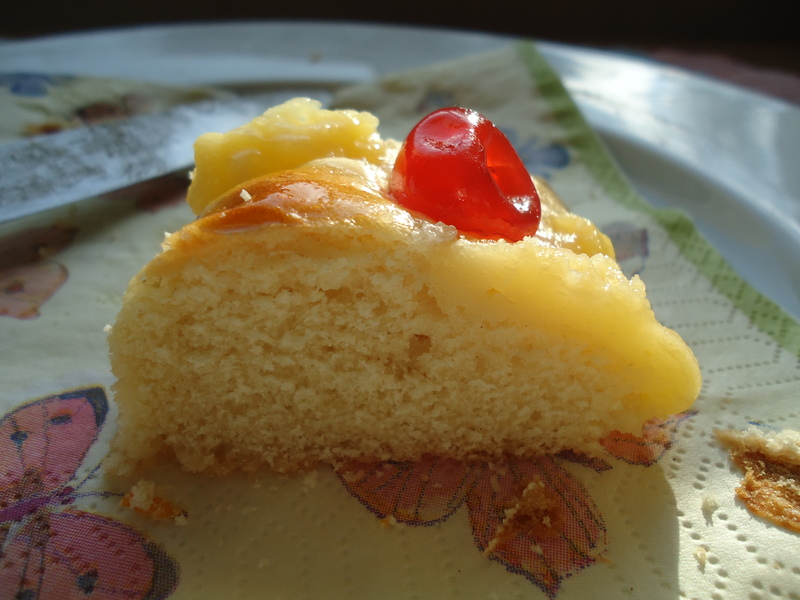 This bread is eaten on Easter Sunday, more often than not as the dessert of a quite substantial Sunday lunch, but sometimes its taken out at tea time, to share with visiting relatives. Traditionally, it used to also have an un-peeled boiled egg as part of the decoration, but it was later replaced by a chocolate egg. These days most people just buy it from a bakery, but if you are lucky enough, you might have a grandma that likes baking and then it will befall on her to make one for Easter Sunday. If you’ll like something different this Easter, why not give this recipe a go? Otherwise, you can make it any day and enjoy it as a sweet treat. It takes a bit of time, but it will be worth your while. The following ingredients make two 1/2 Kg Roscas or 1 big, 1 kilo Rosca. To decorate: crème patissiere, glasse cherries and chouquette sugar. 1.- In a bowl mix the tablespoon of honey, the yeast and the lukewarm milk and let it rest until the yeast froths. 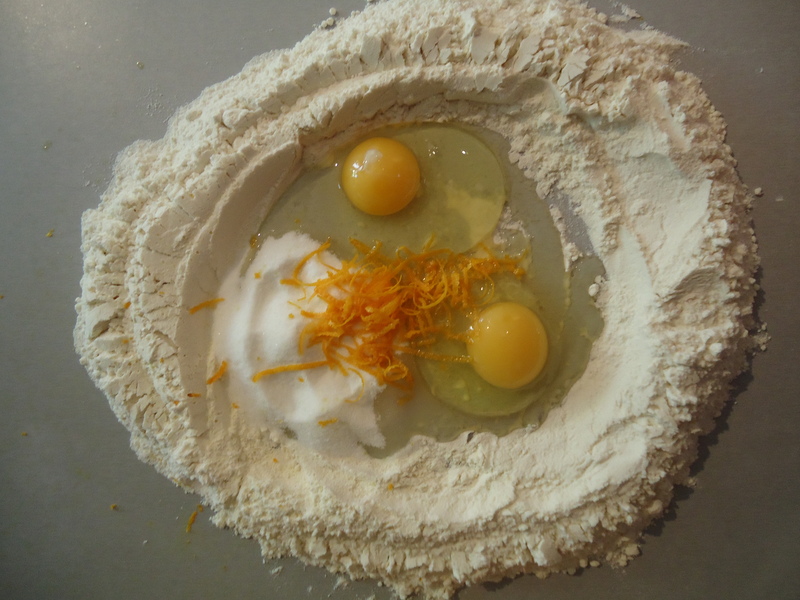 2.- Meanwhile mix the flour and the salt in a clean surface and make a well in the centre. Add the eggs, the sugar, the orange blossom essence, the vanilla essence and the orange zest. 3.- Once the yeast has froth, add it to the centre of the well, and with one hand start to mix all the ingredients inside your well until they are fully integrated. 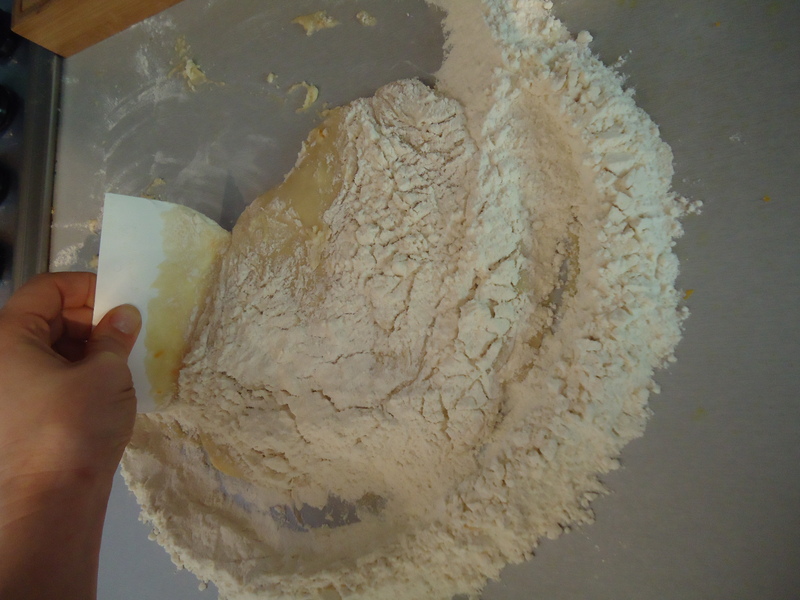 Then, carefully, start adding flour from the sides of the well so that the mixture starts to thicken. At this point you can help yourself with a scraper. Keep adding flour until you have a dough. 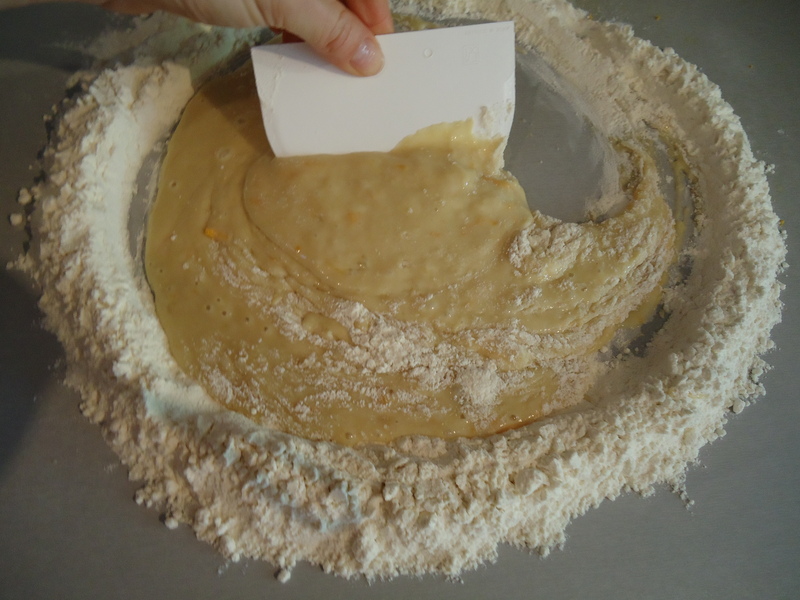 4.- Once you have incorporated all the flour and your dough is workable you will add the butter. It should be at room temperature and therefore pliable. Just add half the butter to the dough and knead until you can’t see any trace of it on the dough, then add the rest of the butter and knead. You will notice that your dough gets very sticky but don’t add any more flour because that will result in a hard, dense and dry rosca (yes, all because of just a little more flour). 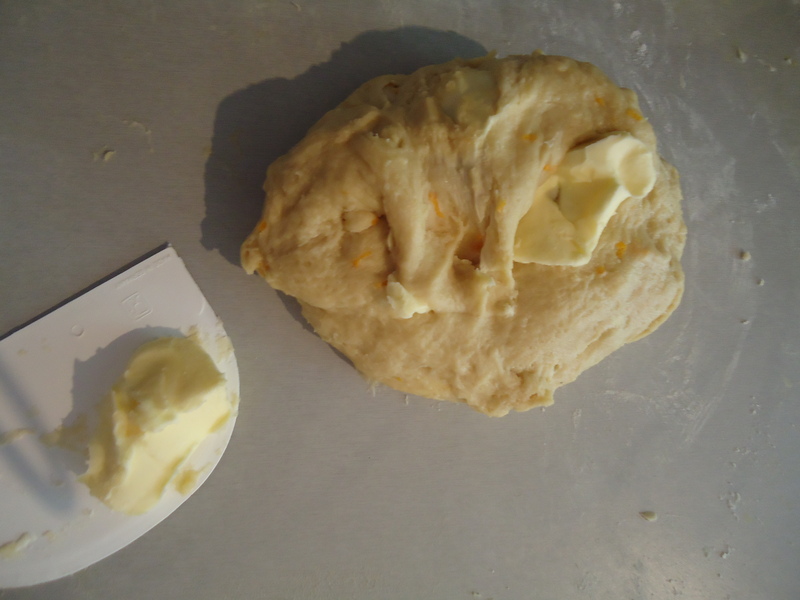 5.- After 10 minutes of working it you’ll have a soft, pliable dough, so just have faith and keep kneading. Let it rest for 15 minutes. 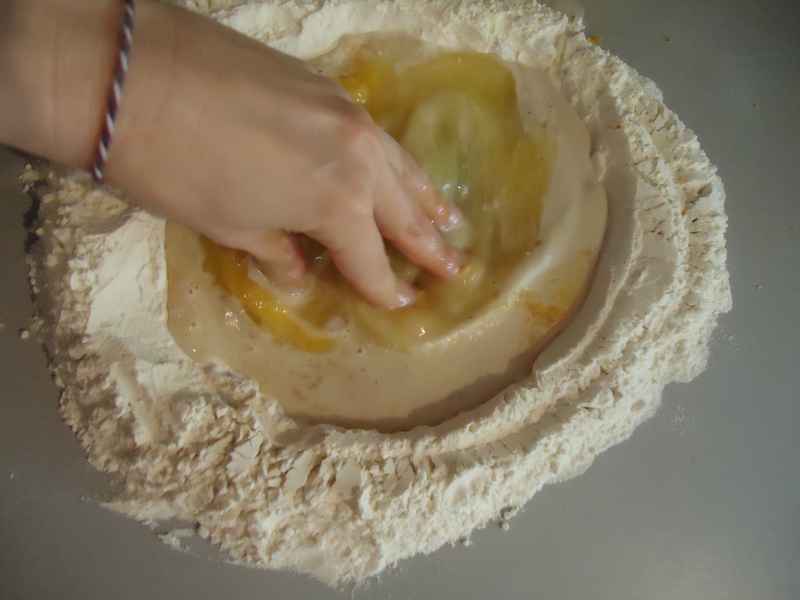 6.- After 15 minutes, dip one of your fingers in flour and use it to make a hole in the centre of the dough. Then use your hand to shape it until the hole is as big as the bottom of a glass. 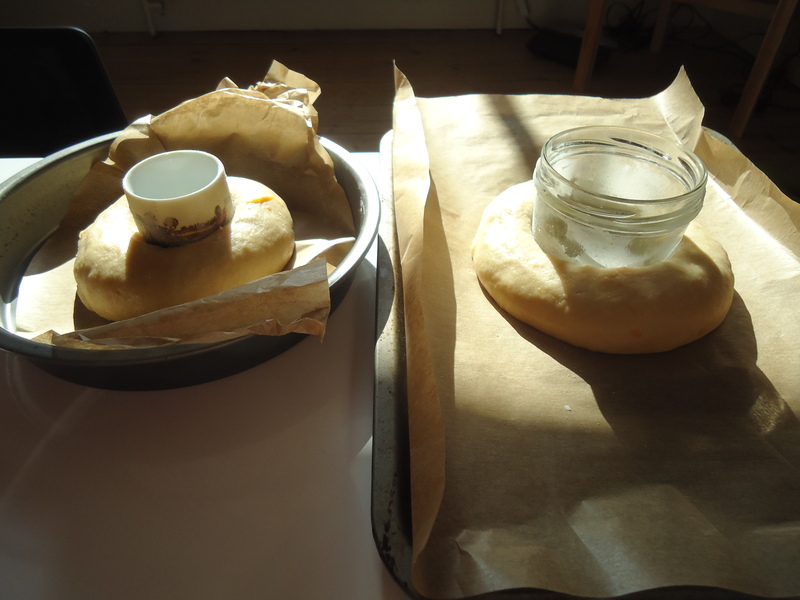 6.- Place the shaped roscas in a baking tray and in the centre of each rosca place a buttered and floured glass jar or glass so that it will keep its shape during baking. Let them rise until double in size. Because of the sugar and butter in the dough it might take up to 2 hours. Whisk the milk into the egg mix whisking vigorously, otherwise you’ll cook the eggs and get scrambled eggs!! If you are new to making crème pat, here is a video that might help you. The quantities are different, just ignore, we are making a lot less crème pat! 8.- To give it the bakery finish you have to brush them with a syrup made out of equal parts of water and sugar, simply boil them together until the mixture thickens a bit, let it cool before you brush the roscas with it. That gives them the glossy finish the Rosca de Pascua traditionally has. 9.- Let them cool down and enjoy!! !